This menu is only relevant if you have more than one map opened in CaWE. It contains items to control the display of the map windows. Cascades all currently open map windows. Displays all currently open map windows and tiles them horizontally. 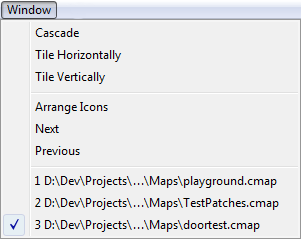 Displays all currently open map windows and tiles them vertically. Arranges the icons off all minimized map windows in the lower left corner of the program window. Displays the next map window. Displays the previous map window. Shows all currently opened maps and marks the displayed map. If you click on the name of a map it is displayed in the window.